Hundreds of lakes and seas are spread across the surface of Saturn's moon Titan. These lakes are filled with hydrocarbons, a form of organic compound that is also found naturally on Earth and includes methane. While most of the liquid in the lakes is thought to be replenished by rainfall from clouds in Titan's atmosphere, the cycling of liquid between the subsurface, surface and atmosphere is still not well understood. Scientists have modelled how a subsurface reservoir ('alkanofer') of liquid hydrocarbons, filled with rainfall runoff, would diffuse throughout Titan's porous icy crust. They found that this diffusion could cause a new reservoir – formed from clathrates - to form where the bottom of the original reservoir meets layers of non-porous ice. Clathrates are compounds that form a crystal structure with small cages that trap other substances like methane and ethane. 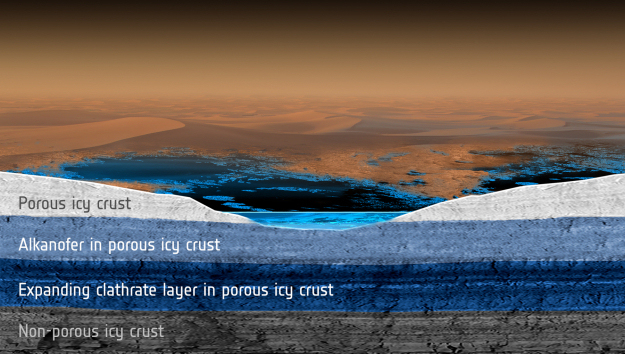 Titan's subsurface clathrate reservoirs would interact with and fractionate (separate) the liquid phase within the original underground hydrocarbon lake, slowly changing its composition. Eventually, subsurface lakes that had come into contact with the clathrate layer would mainly be composed of either propane or ethane, depending on the type of clathrate that had formed. Importantly, this would continue up to Titan's surface. Lakes fed by these propane or ethane subsurface reservoirs would show the same kind of composition, whereas those fed by rainfall would be different and contain methane, nitrogen, and trace amounts of argon and carbon monoxide. The composition of the lake would indicate what was happening deep underground.